Weddings in Donegal are the best in the world. Fact. 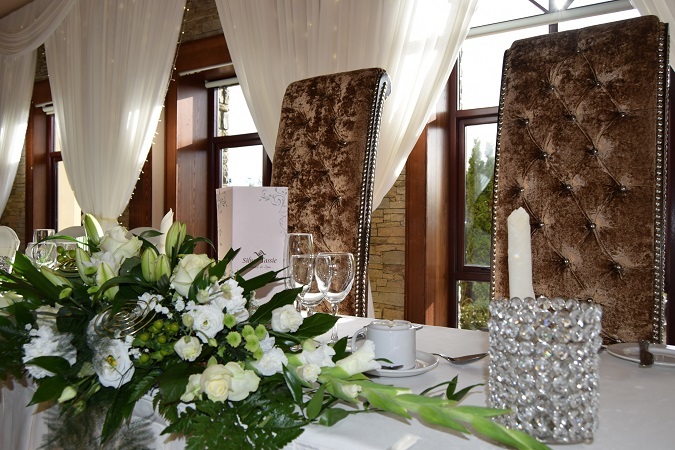 We are so lucky with the choice of venues in our gorgeous county and couples are truly spoilt for choice when it comes to choosing their perfect Wedding Venue. So, with so much competition around, venues really need to be at the top of their game to attract coupes to their hotel; this is something that the Silver Tassie Hotel & Spa does so well. When you mention to anyone that you are attending a wedding at ‘The Tassie’ you are automatically met with a chorus of ‘Love the Tassie’, ‘Always a good wedding’, ‘Great food’ etc and as I found out for myself this praise (and more!) is well deserved! I was invited by the Silver Tassie Hotel to spend a day with the Wedding Team and get a behind the scenes look at the hotel in action on the day of a real life wedding and while they asked me to write a blog about my experience to promote the hotels wedding offering, all thoughts, words and opinions are my own – TeamBride can’t be bought! I have been to a few weddings in the hotel over the years and always enjoyed it but to be honest I was always too busy enjoying the craic to really take in what was going on around me! Yesterday was different, I got such an insight into how hard the staff work to make it all run seamlessly – and it runs so seamlessly that as a guest you don’t even notice how hard the staff work! 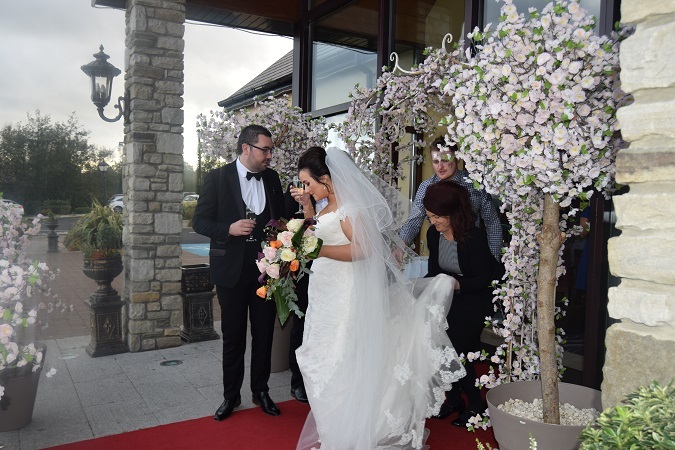 I arrived at the hotel around lunchtime on October 12th 2018 – the day of Rory and Emma’s Wedding. Storm Callum was forecast but thankfully he was only a small c and not the big C everyone expected! When I arrived set up was well under way, General Manager John Brown explained that setup starts at 4.30am with clearing out and setting tables (I’ll just have to take his word for that as I won’t be there to witness it any time soon lol). 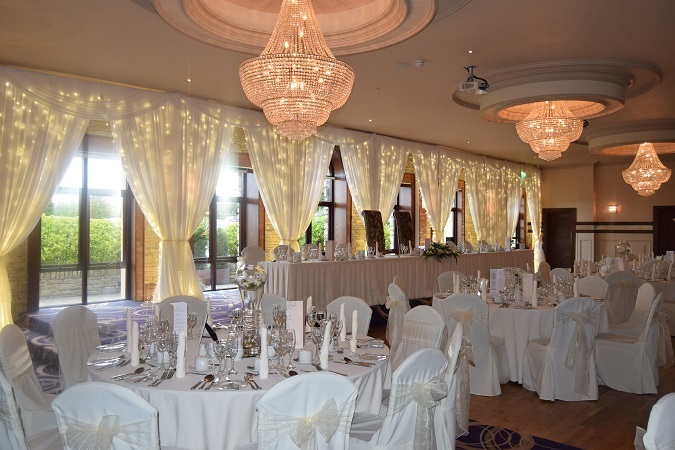 The first thing that hits me when walking into the Woodlands Suite is the amazing light that floods the room, it’s a beautiful room that holds up to 600 people but still looks really well set for a wedding of 200. 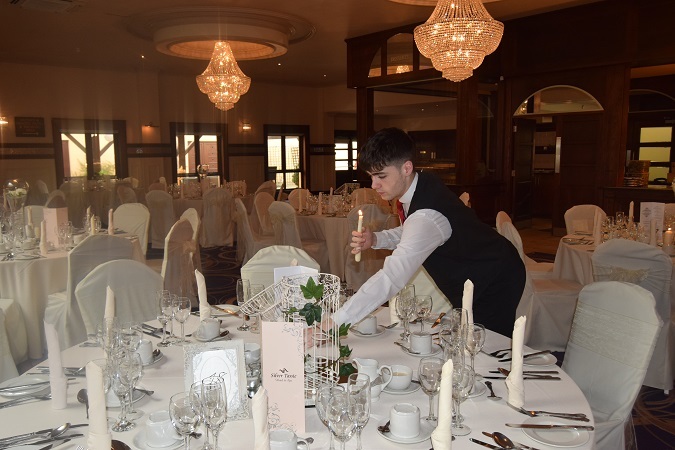 Todays wedding was set for 220 and everything looked pristine, the operations staff were busy putting the finishing touches to the setting while the Chefs were busy preparing in the kitchen. 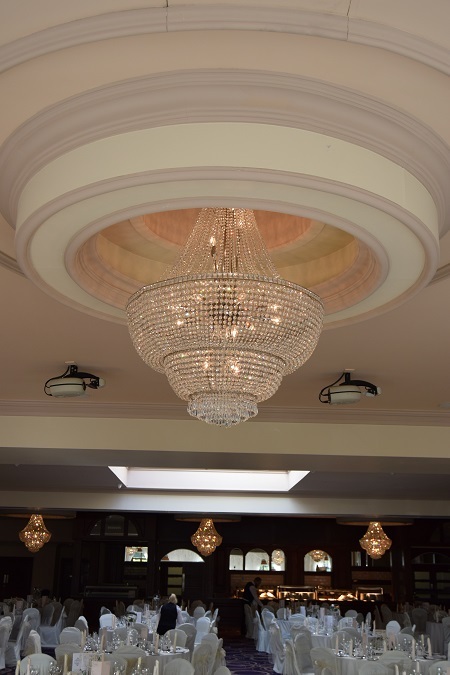 The Woodlands Suite has its own separate entrance which is such a bonus as it keeps your guests together and the arrivals reception is exclusively yours. 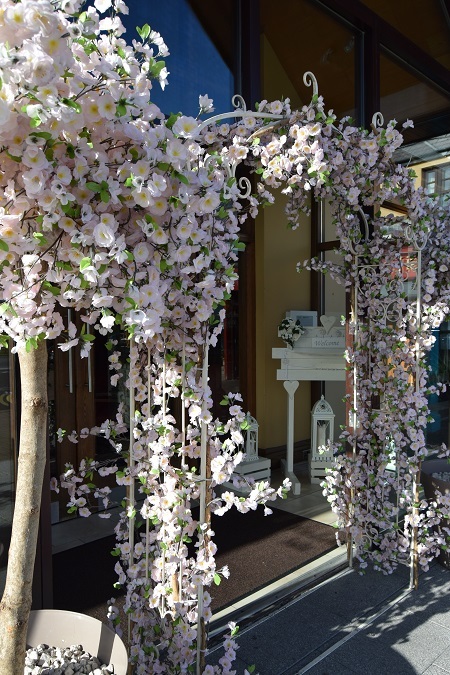 The entrance looked so pretty lined with cherry blossom trees and a matching arch that the hotel provides complimentary and a truly awesome Cherry Blossom Tree Table Plan courtesy of their chosen décor suppliers Banquet Chair Covers! Talking to the Wedding Coordinator Georgina Howley and Manager John, I got the feeling that they really take time to get to know each couple and that they want each wedding to be personal. The Arrivals offering at the Silver Tassie is amazing! Rory and Emma opted for a Donut Wall which I loved and served Prosecco & Guinness to their guests along with the usual Tea, Coffee and fresh scones. You can literally have anything you like for the arrival reception from a BBQ, Snack Bites, Soup Shots, Cheese Board (my fav! ), cocktails – they even have their own Ice-cream Cart and Candy Cart that can be added to your package. Rory and Emma gave us permission to blog about their Wedding Day and what a lovely couple to feature! They arrived at the hotel around 4.45pm and Georgina and John were there to congratulate and greet them like old friends. You could tell that there was a bond between them all and that Georgina was genuinely delighted for the newlyweds. Timing is everything when it comes to weddings and part of Georgina’s job is to make sure that the couple get the photos they need in the hotel and get plenty of time to relax with their guests before dinner. With this in mind the couple are whisked quickly into the Woodlands Suite along with the photographer and video team while John takes the opportunity to check the couple have a drink of choice and to take their dinner order. It strikes me that Emma and Rory are as comfortable talking to Georgina and John as they are talking to their own guests and during the (very emotional) speeches the Groom gives a very special thank you to Georgina and John and you can tell that there is genuine sentiment in Rory’s words and not just the usual ‘have to thank’. The Silver Tassie is well known for offering good food and when you see the work that goes into preparing it you can see why. Head Chef Chris leads a talented team who clearly enjoy their work and were only too happy to show off their skills when I popped into the kitchen! I was so impressed with the fact that EVERYTHING is made fresh on the day. When I went into the kitchen Chef Corbyn was busy making pastry for todays Apple Pies and the Beef was slow roasting away in the biggest oven I have ever seen! The food is so fresh, and the team work unbelievably hard to get it from the kitchen to the table so that all guests eat together. All the food is plated and served in sight of the guests and Chef Chris carved the beef as it was being plated – watching the service was like watching a well-oiled machine, everyone knew exactly what needed to be done and the focus was to get the food out to the guests while it was piping hot and the team achieved this with precision! Service was completed in a very impressive 1hr 45mins and the highlight has to be the Sparkler dessert finale served to the top table – its so effective and the guests really seemed to enjoy it! I genuinely could talk all day about my experience at the Silver Tassie but sure that would only bore you! The main thing I took away from my day learning about Weddings at the Silver Tassie is that they care, the attention to detail is amazing! Georgina let me have a sneaky peak in the Honeymoon Suite and it was just lovely. Aside from a gorgeous room complete with 4-poster bed and jacuzzi bath, they have added little personal touches such as lit candles, romantic music and scented reeds which I loved! Having worked in the wedding industry for many years I have often heard brides say how Georgina made their day and having had the pleasure of spending the day observing her, John and the team I totally understand why. It’s the people that make your wedding day special and you want to surround yourself with suppliers that care about your wedding, that want to make your day memorable for all the right reasons and I think if you choose to have the Silver Tassie team in your corner for your Big Day then you can’t go far wrong. Thank you to Emma and Rory for letting me Gatecrash your wedding day and to Sharon H Strange Photography and PG Films for letting me tag along. A huge thank you to John Brown and the staff at the Silver Tassie Hotel for making me feel so welcome and a special thanks to Georgina Howley for giving me the opportunity to witness an award-winning wedding coordinator in action!